When you think of Sichuan, the first thought that comes to mind is undoubtedly the intensely spicy food that the province has become internationally famous for. Sichuan-style cuisine ranks as one of the Eight Great Culinary Traditions of Chinese Cooking, and is well-known for its liberal use of garlic, ginger, Sichuan pepper, and hot chillies. Its signature dishes, such as Kungpao Chicken and Twice Cooked Pork, have delighted palates in Chinese restaurants throughout the world. With such fiery appetites, it’s no wonder that Sichuan Opera is famous for its fire-spitting act! The province itself is located in southwest China, nestled in the upper Yangtze River valley. Near the centre of the province, the provincial capital of Chengdu represents Sichuan’s cultural and historical heart. Sichuan was one of the first areas in China to have been settled by the Han Chinese, and evidence suggests they may have migrated there as far back as the 5th century BC. In 1987, a group of archaeologists uncovered artefacts near Chengdu that indicate a Bronze-Age civilization known as the Shu once populated Sichuan. Many of these bronze objects date back to 3000 BC, making them over 5,000 years old! They are spread between two archaeological sites, the Sanxingdui site and the Jinsha site, both of which house many of the artefacts in their respective museums. Geographically speaking, the province can be roughly split into two main areas: the fertile Sichuan Basin in the east, and the rugged mountain valleys to the west. 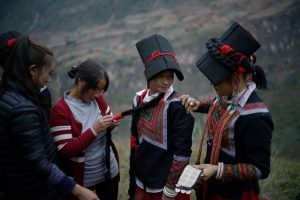 While the Sichuan Basin is heralded as a “Heaven on Earth” thanks to its mild, humid climate and abundant natural resources, the western valleys represent a much harsher terrain that is notoriously difficult to inhabit. Surrounded by lofty mountain ranges and extensive plateaus, parts of western Sichuan are so geographically distinct that they exhibit a subarctic climate, with temperatures dropping as low as -30 °C (-22 °F) in winter! That being said, the weather in Sichuan is generally mild. During summer, temperatures rise to a comfortable 29 °C (84 °F) in the south, while they remain a steady 20 °C (68 °F) in the west. Winter temperatures decrease to about 12 °C (54 °F) in the south, but plummet to a chilly −8 °C (18 °F) as you go further west. However, the east does suffer from a particularly fierce rainy season from April to August, and the area is notoriously so overcast that there is an old local saying which states, “Sichuan dogs bark when they see the Sun”. Consequently, the best time to visit the province is from April to May and September to October, with autumn heralded as the most beautiful season for enjoying the copious natural scenery. With its unusual geography, Sichuan is one of the most bio-diverse provinces in China and boasts a range of spectacular nature reserves, from dense highland forests to lush grasslands. Many of these reserves are home to some of the most fascinating and endangered animals on the planet, such as the Sichuan takin, the snow leopard, the clouded leopard, the red panda, and the giant panda. 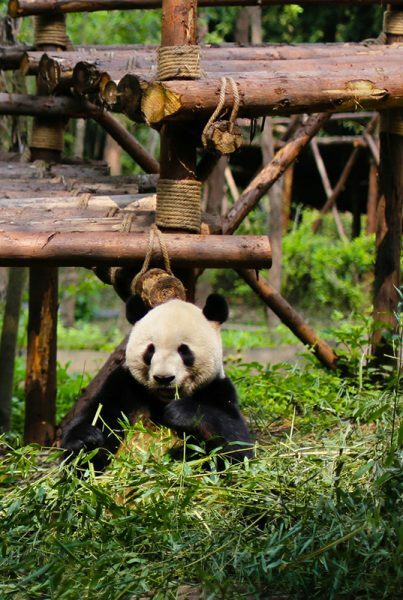 The province is famed for its indigenous wild panda population, with seven nature reserves and nine scenic parks dedicated entirely to these cuddly creatures. They were collectively designated a UNESCO World Heritage Site in 2006. Every year, visitors flock to places such as the Chengdu Panda Research Base and Bifengxia Panda Base in order to catch a glimpse of these gentle giants. Yet these aren’t the only natural treasures that the province has to offer. Other UNESCO World Heritage Sites include mystical Jiuzhaigou, a river valley of ethereal beauty; Mount Emei, one of Four Sacred Mountains of Chinese Buddhism; the Leshan Giant Buddha, a colossal 71-metre-tall (233 ft.) statue that has been carved into a cliff-face; and the Dujiangyan Irrigation System, an ancient system of artificial waterways that dates back to the Qin Dynasty (221-206 BC). With such a plethora of heritage sites on offer, you’ll start to wonder what attractions in Sichuan aren’t on the World Heritage List! In fact, the natural scenery in Sichuan is so inspiring that it served as the muse for China’s two greatest poets, Du Fu and Li Bai. While Li Bai grew up in the province during the Tang Dynasty (618-907), Du Fu fled to the province in his later life after his political career went sour and many of his most powerful poems were written during this time. The thatched cottage where Du Fu used to live is now open to the public, and can be found in the western outskirts of Chengdu. Along with these two phenomenal talents, Sichuan was also the birthplace of the celebrated politician Deng Xiaoping. Although the majority of the province’s population is Han Chinese, it does feature a wide range of other ethnic minorities, including large constituencies of Yi, Tibetan, and Qiang people. Ngawa Tibetan and Qiang Autonomous Prefecture, Garzê Tibetan Autonomous Prefecture, and Liangshan Yi Autonomous Prefecture are all ideal places to travel and engage with the unique cultures of these colourful ethnic groups. So be sure to put a little spice into your China travels, and schedule a stop in Sichuan!